Thanks to Dr. Leena D. Joseph, Sri Ramachandra University (India) for contributing this case. To contribute a Case of the Week, follow the guidelines on our main Case of the Week page. (1) We have launched a new Fellowships page. The changes include: (a) ability to search by year of opening, specialty, state / country and posting date; (b) all data appears on a single page (currently it appears on 2 pages); (c) cleaner format; (d) faster updates. The default page has a sort of summaries by year of opening, followed by a sort of ads by state / country and subspecialty. Let us know of any comments or questions you have. (2) Our newest Commercial Email Contest Winner is Dr. Yvelisse Suarez, Tufts Medical Center, Boston, Massachusetts (USA). A $50 Amazon gift card was sent to Dr. Suarez. Please make sure to sign up for and read our Commercial Emails for a chance to win at another contest. There were very low entries in the last contest - remember, you can't win if you don't enter! (3) We are currently accepting interesting cases for Case of the Week. When we receive your case and images, we will add them to a queue of pending cases, and send you an email notification 1-2 weeks before your case will be posted on the website and sent out via email. Please make sure your case contribution follows our guidelines. For more information on how to contribute a case, visit our main Case of the Week page. If you have any questions, please email Dr. Pernick at NatPernick@gmail.com. A 51 year old man presented with blood and mucus in his urine, and ultimately had a kidney resection. The radiology images show a large cystic structure growing from the right side of a horseshoe kidney. 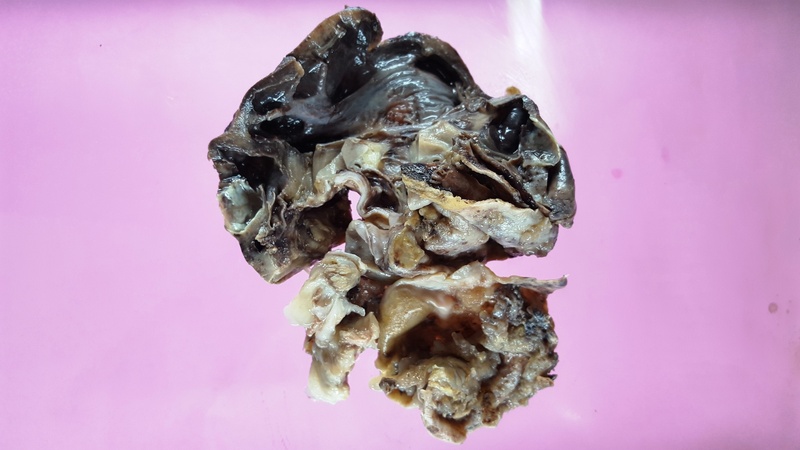 Grossly, the resection specimen consisted of atrophic kidney parenchyma with hydronephrosis and a multiloculated cyst projecting from the pelvis. 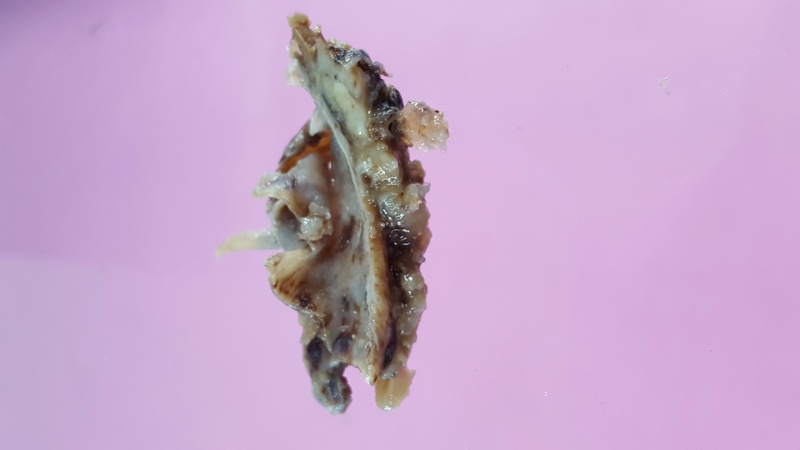 On cut section, the cyst wall contained papillary projections with a mucoid appearance. 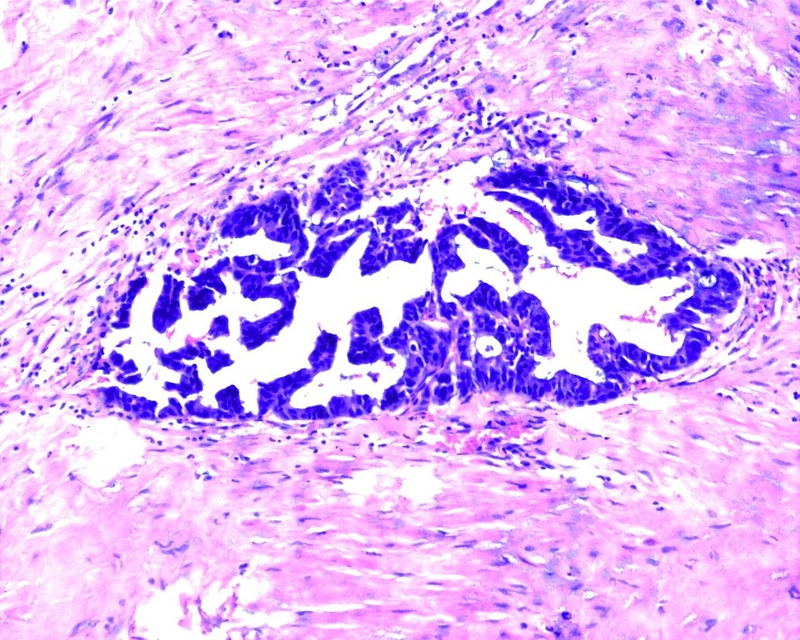 Histologically, the cyst lining epithelium was mucinous and columnar, with areas resembling adenomatous colonic epithelium. Invasion into the cyst wall was present. 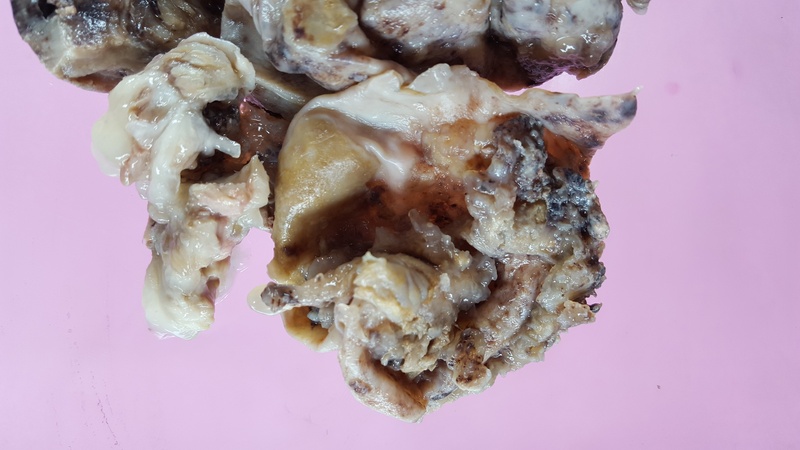 Epithelial tumors of the upper urinary tract are uncommon, with an estimated incidence of 1.2 cases per 100,000 persons per year (WHO Classification of Tumours of the Urinary System and Male Genital Organs, 4th ed, 2016). 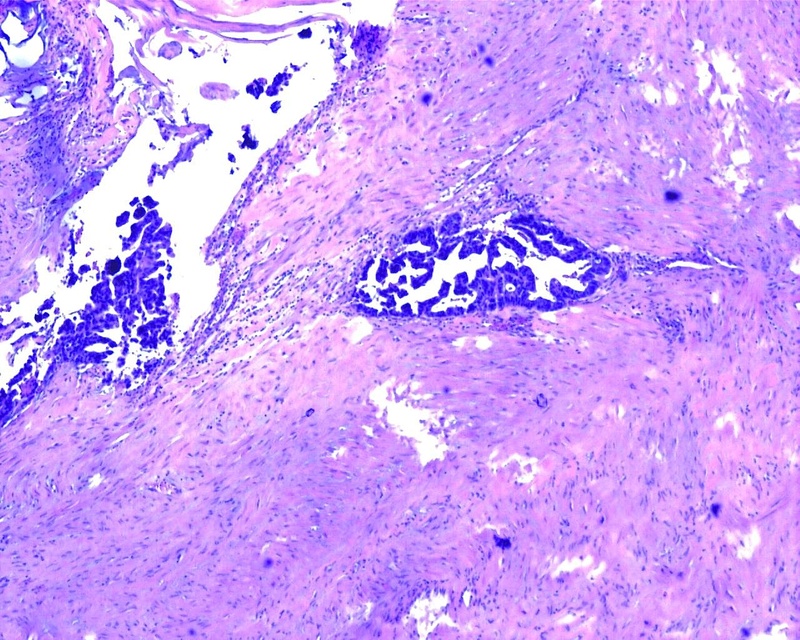 Adenocarcinoma represents less than 1% of carcinomas arising in the renal pelvis (Arch Pathol Lab Med 1985;109:954). They are thought to arise from glandular metaplasia of the urothelium, which is associated with chronic irritation, stones and obstruction. Tumors with abundant mucin production can cause mucusuria in addition to hematuria, as in this case. 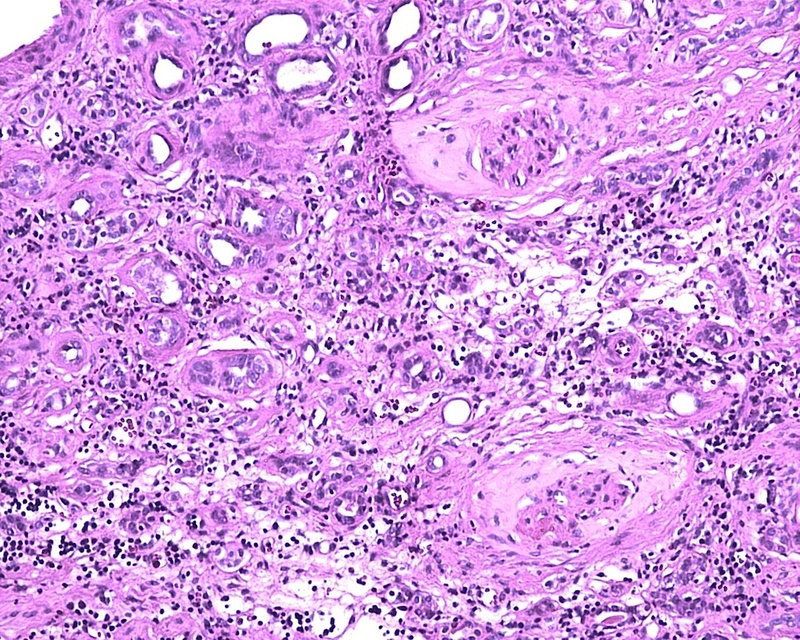 Benign cystadenomas of the renal pelvis have been reported, and may represent a precursor lesion to cystadenocarcinoma. 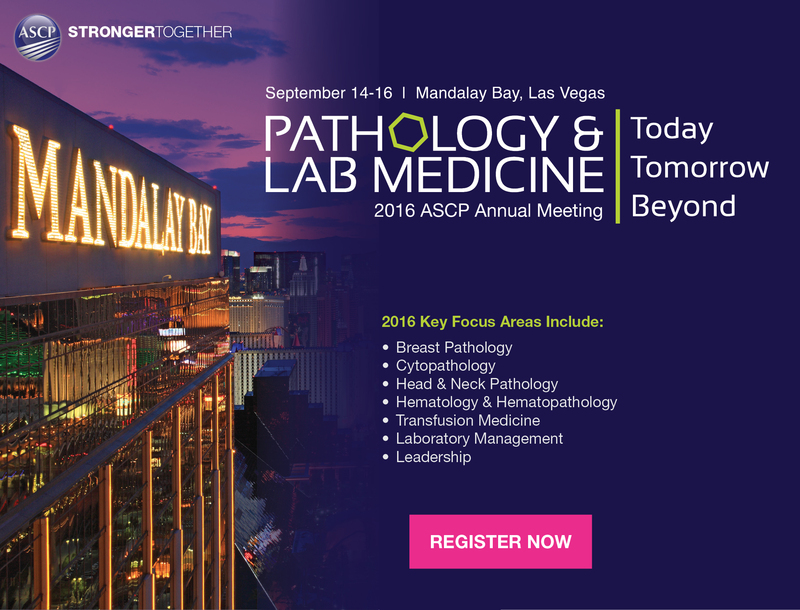 Interestingly, a papillary mucinous cystadenoma has been previously reported in a horseshoe kidney (Arch Pathol Lab Med 1985;109:954). 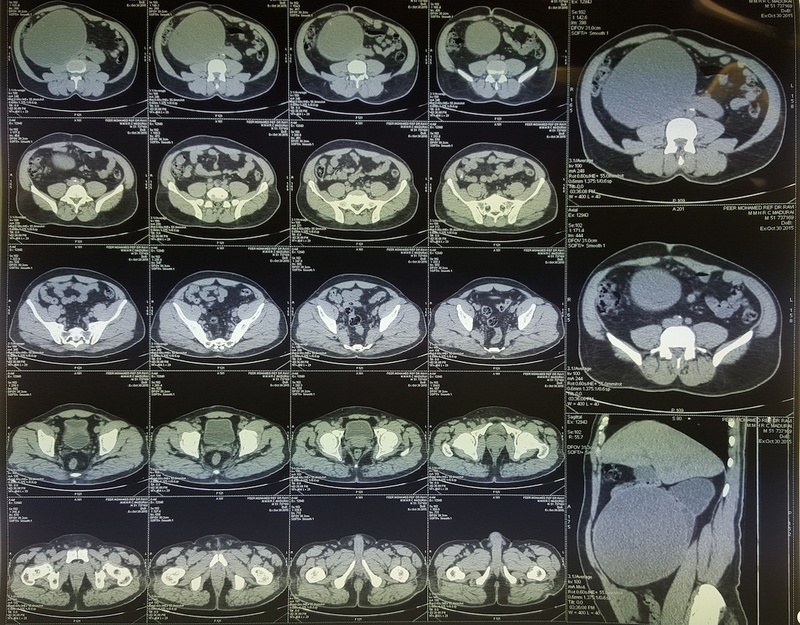 Certain types of tumors are more common in horseshoe kidneys, such as Wilms' tumor (J Pediatr Surg 2004;39:207) and neuroendocrine tumors / carcinoids (J Urol 2006;176:2359). The relative risk of urothelial carcinoma is increased as well, due to chronic obstruction, stones or infection. However, the incidence of renal cell carcinoma is not increased (eMedicine). 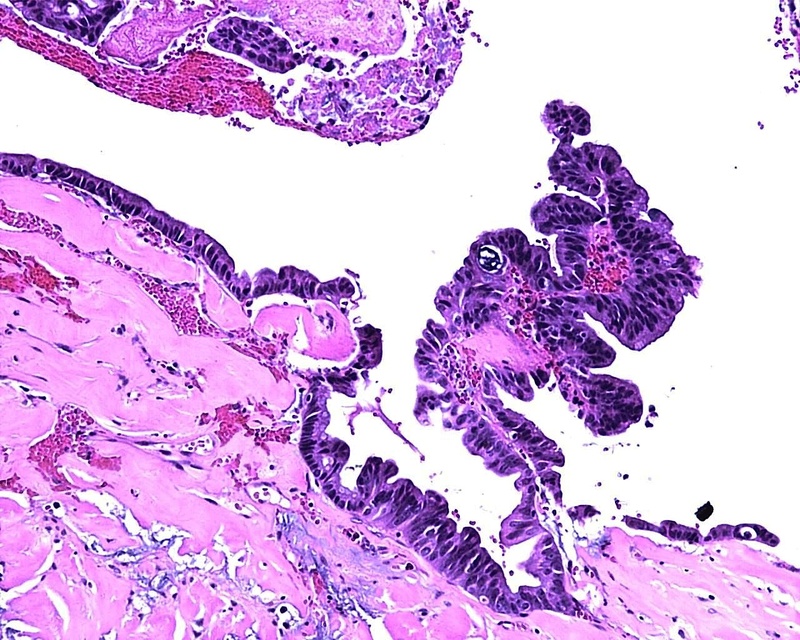 Primary adenocarcinoma of the urinary tract can be difficult to distinguish from a colorectal primary that secondarily involves the urinary tract, both by morphology and IHC. Both can be positive for CDX2 and CK20. 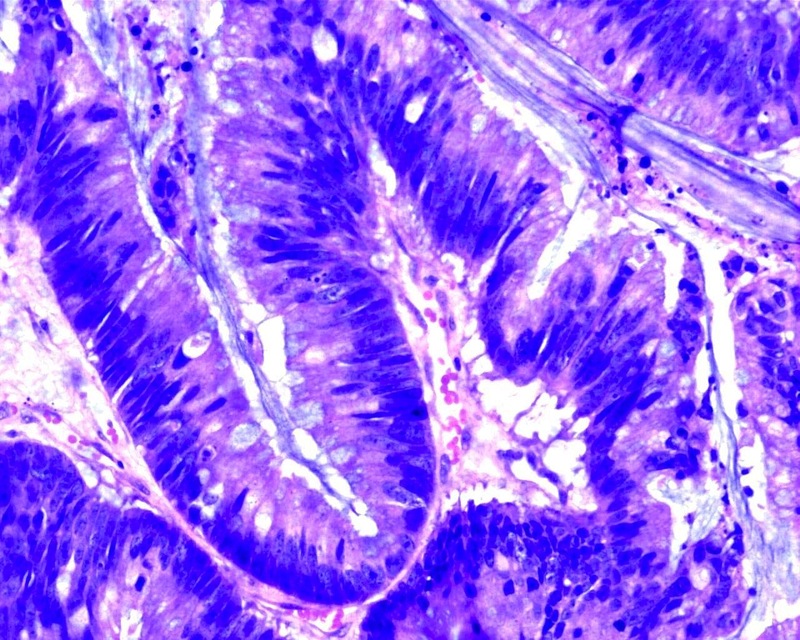 Expression of CK7 and GATA3 favor a urinary tract primary, whereas nuclear positivity for β-catenin favors a colorectal primary (J Clin Pathol 2016;69:307).